While reviewing the BSI: zucchini recipes, the stuffed zucchini boats really impressed me. I knew I had chicken to use up and an acorn squash in the pantry, so the two were combined and the idea for dinner was born! First, mix 1 cup of whole grain brown rice mix that your mom mailed you with 2 cups of vegetable stock and cook for 50 minutes. Roast an acorn squash in the oven for thirty minutes at 350° with a little water in the bottom of a covered pan. Cook bite-sized pieces of chicken, shallot, red pepper, carrot, celery, garlic, salt and pepper in a skillet with a little bit of olive oil. Next, combine the rice, chicken/veggie mixture and spoon into the empty squash. Cover with foil and bake another 20 minutes while Johnny tells you the story about how he got pulled over on his way into work. Last, serve on a plate and eat until it looks like this! What a great idea! That reminds me I need to buy spaghetti squash soon! 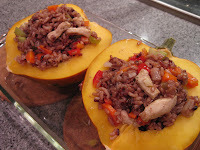 I've never tried acorn squash, I may have to do that soon. Thanks for showing me how to cook it, your dinner looks yummy! That stuffed squash looks good!